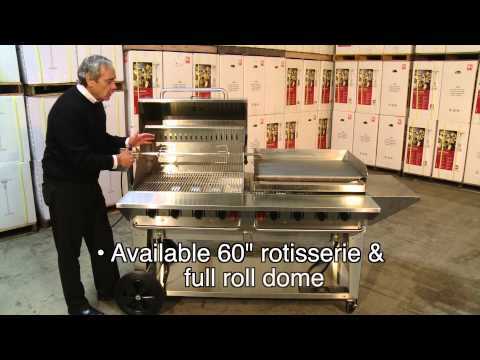 Home / Restaurant Equipment / Cooking Equipment / Outdoor Cooking Equipment / Portable Outdoor Grills / Crown Verity MCB-72LP Mobile Grill, Liquid Propane, 10 Burners, 81"
The Crown Verity MCB-72LP Mobile Grill is the ultimate in barbecuing. This grill is available as liquid propane (LP) and comes equipped with a two stage regulator and hose. Unit has a built-in tank holder that accommodates standard 20 pound propane tanks (not included) with a unibody design for lighter weight and added strength. Unit is constructed of 304 stainless steel including grids, burners, fasteners and pilot tubes. This (10) burner grill is equipped with a storage shelf and angled legs for solid durability, 16 gauge stainless steel radiants and water pans with drain ports. Comes standard with (2) 14 inch wheels and (2) total lock casters. This ready-to-use unit ships completed and assembled on a skid.